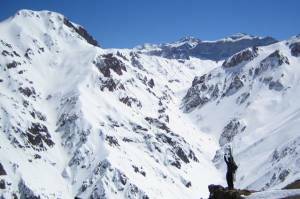 The tiny ski resort of Penitentes is located about 200 km west of the city of Mendoza on the international road to Santiago de Chile. A cluster of buildings between the highway and steep mountainsides with ski lifts rising above, this is an interesting spot to ski. The terrain is fun, the area uncrowded and the scenery spectacular. From Mendoza, the road climbs gently on the Argentine side of Cristo Redentor (or Paso Los Libertadores) toward the border crossing to Chile. Across the highway from the ski resort are the Penitentes, huge rock spires named by the conquistadors as they made their way across the mountains. This region is where some of the higher Andean peaks are, most notably Aconcagua, the tallest peak in South America at 22,841 feet (6,962 meters). The inbounds ski area terrain is good and entertaining for intermediates or below, but for a short trip, it is a worthy place to check out for any level of skier–we can attest. The skiing and the location are fun, but the food and lodging pretty basic. You can probably allot 2 or 3 days for a quick, fun trip and get your fill of Penitentes. The terrain is wide open, alpine runs; the nearest tree or scrub bush is hours away. Ski long gullies, open powder fields, rolling bowls and little rocky chutes from top to bottom. Inbounds does not offer a large of amount of very challenging terrain, but beginner and intermediate skiers will be very entertained. The nearby back-country is amazing, but consists of serious lines in serious avalanche terrain. Some of the ski patrollers have a little useful beta, but this isn’t really a place to just wander out of bounds. There is not much for nightlife, restaurants, or entertainment. Sometimes there are shows, bonfires, or occasional disco nights put on by one of the hotels or restaurants, but don’t go to Penitentes expecting to party all night. Up the road a little bit is the Puente Del Inca, a natural bridge over the Vacas River and beautiful ruins of a hot springs resort. There are no pools, though, and they like you to stay out of the ruins. There is often a little outdoor market with local crafts, and you can also get a good view of the Aconcagua massif from here. All of the accommodation here is fairly basic and hasn’t seen any recent renovation. Mendozaski is a tourism website that has a vague overview and photos of all lodging choices. The Lomas Blancas is one of the bigger hotels, and contains apartments for 4-6 people. Edificio Portezuelo is a charming, vaguely European looking building from the outside but plain on the inside. You can get a kitchen and up to 10 beds (54-0261 428 3601). Other hotels offer similar lodging. There are two hostels in the base area, the Cruz de Cana or Hostel Internacional Penitentes. If you hostel it, stay at the Penitentes (0261-425-5511). Be sure to know if you are going to be there during either an Argentine or Chilean holiday, as the place can get very crowded and all the beds sold out. The restaurant scene is small, and not too, ah…sophisticated, and pretty much just in the hotels. There is a tiny grocery, but if you want to have your own food you should probably stock up in Mendoza. In Mendoza, you will have to ask at the bus station to see which companies are currently taking people to Penitentes, or arrange a charter. If you plan to stay put in the ski area and then head back to Mendoza, you don’t need a car at all, but to check out Punte del Inca or the road to Chile, or stay somewhere else along the road besides the base, you will need a car. This page rendered in 0.775 seconds.